4 Bedroom House To Rent in Orpington for £2,300 per Calendar Month. This four bedroom detached executive style home offers fabulous accommodation over two floors. 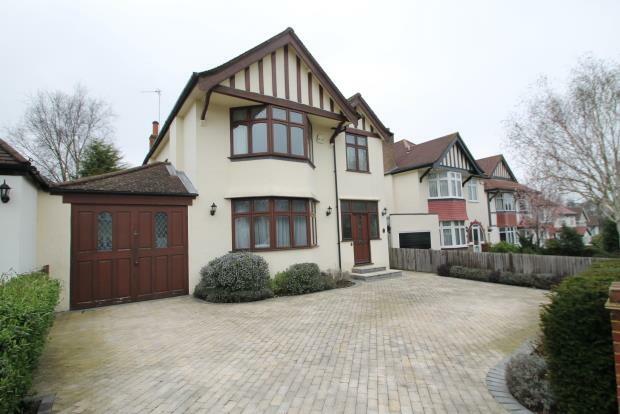 The house is located in the perfect position to give quick access to Orpington station yet you would not realise this seeing the lovely residential road of similar property. The paved and walled driveway leads to the front porch giving access to a large well proportioned hallway. There is an excellent dining space to the front aspect with a bay window, large table and eight chairs around and feature lighting over, there is a side board, console table, and bookcase or display shelving a green painted walls sets the scene for space to enjoy a dinner party or so. The rear reception room looks over the garden with French doors that can be opened in the warmer months to enjoy the garden. The room has a feature fireplace (for show) and lots of character, there is a pair of leather sofa's in this room, and a coffee table with occasional furniture too. The kitchen is well laid out with a wealth of cupboards and ample work surfaces to cook for a family, there is a gas hob, double oven, fridge freezer, dishwasher and washing machine installed in the kitchen, there is a rear garden door too. There is a downstairs shower room with glass shower cubicle, basin with vanity storage, and toilet. A useful storage cupboard is built in under the stairs ideal to keep the hallway free of clutter. The first floor has a spacious master bedroom with a bay window, a large range of wardrobes offering lots of varied storage. There is a separate dresser and a bed will be supplied to fit between the bedside wall lights. There are two further double bedrooms to the rear of the house both with double beds, and lots of storage wardrobes and further furniture for clothes and belongings. Bedroom four is set up mainly as a study bedroom with a desk and wall units, but there is room for a single bed to one end if required. The family bathroom has lovely stylish tiling to compliment the bathroom suite giving a traditional feel to the room, with a white suite comprising of bath with central taps and shower to the end, basin and toilet, glass shelving is available and there is a heated towel rail too. The floor is tiled. Generally the house is carpeted in a pale cream carpet but there are some rooms where there is a change to this as seen in the photographs provided. The garden has been created by professionals to give a large area of patio, with mood lighting in several areas, and there is a large lawn edged with brickwork and a mature range of plants and trees, and to the end there are storage sheds for garden furniture and tools. This property is within walking distance of Orpington High Street.